The Technology Showcase Evening is about celebrating the achievements of our extremely talented students in all areas of Technology. This year the 13 Fashion and Design students went for a tropical theme creating a colourful explosion to warm the audience from our current climate. The class competently pulled together a tight evening of entertainment for parents and local community. Guests entered through the hall to the exhibit space before being led to the staff room for the presentations of Mr Tan's DVC classes. 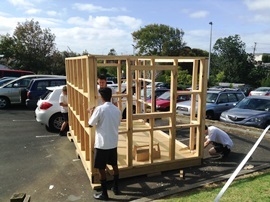 Students displayed their vision for a new development space at Auckland's MOTAT. Some truly innovative ideas! The senior hospitality students mentored by Mrs Townsend and Mr Davis were busy all day preparing tempting tasters and beverages to showcase their skill set. Students were praised for their customer service and exceptional food. Mr Lee then demonstrated the motor bikes developed in his senior Technology class. Guests then went back to the hall for the fashion show which delighted the audience with original garments made from textiles and repurposed materials. There was a selection of garments on display from Years 9 to 13. Students confidently modelled not only the garments but talents of the Beauty Therapy class with their creative use of stage make-up run by Miss Matheson. Thanks to the Technology staff for their support in helping me run this yearly event and a special thanks and well done to my Year 13 Fashion and Design class for planning a flawless evening which truly demonstrated how talented and capable the students of Lynfield College are. At the end of the year Year 9 Soft Materials students completed a unit on making a cushion which represented their own individuality. They used a variety of techniques and processes..Screen-printing, Tie dying, Stencilling, Hand painting, Applique and Beading. 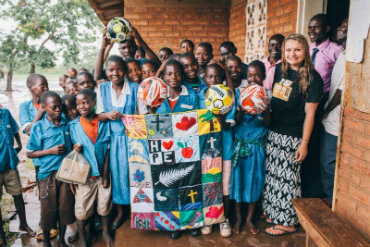 On Monday September 1 Danielle Aldridge came in from World Vision to be presented with the quilts students produced in Terms I and 2 during Year 9 Soft Materials Technology. Students chose a multi-cultural theme and used applique, decorative stitching and hand stitching. 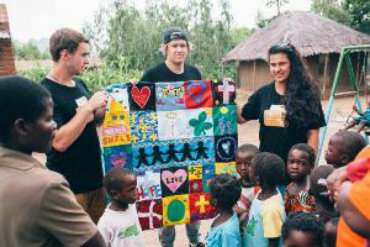 This year the quilts will be going to Bangladesh. The Year 12 Fashion and Design Class enjoyed their two day trip to DAS Training Sew Tec Academy - a chance to work in a tertiary environment. During the visit they were taught how to adapt a dress block and operate the industrial sewing machines. They were then given the challenge of adapting this dress block into their own creation for the SewTec Junior Designer competition. The top best 10 designs will be shown during their fashion show on the 5th December and the winner will receive a cash prize and the school will get two mannequins. 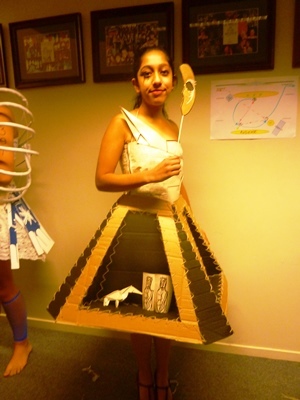 As previously reported Lynfield College had 10 finalists in the Auckland Councils Trash to Fashion competition. Well done to all the girls who made it through and for all their hard work and commitment to the show. Congratulations to Kayla Rousselle (centre below) who received Highly Commended for her Aesthetically Asian category and took out the Young Emerging Designer. Kayla won a $2000 scholarship for future study and a fashion mannequin. Her garment ‘Sweet and Sour’ was made from recycled fabric, egg cartons and knitting needles. The Trash to Fashion competition also provides the learning support students with the opportunity to be present and actively involved within the community and to receive recognition for their skills that they have to contribute within society. 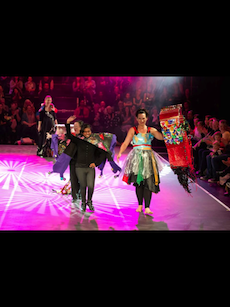 ‘Dressed to Kill’ created by Albert Ama, Priyanka Anand (model), Leon Bartley, Rebecca Fleming-Yates, Nicolette Half, Sophia May and Lena Zhang-Harrap(model) also won the Special Achievement award. There garment was made from recycled fabric, cardboard boxes, Christmas baubles, chocolate wrappers and sequins. 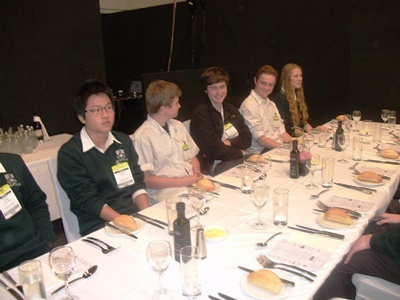 Adeleena Lee-Hussien Year 12, reports..
Year 12 hospitality classes were given the amazing opportunity to go to the Fine Food New Zealand exhibition held at ASB show grounds. We were fortunate enough to observe the New Zealand and Australian culinary team prepare and serve us a three course meal to a very high and satisfying standard. All of the students enjoyed this experience thoroughly as they got to learn the ways of the hospitality industry including the right ways to serve customers, table setting and food presentation. Companies were also there to sell their products and we got to sample a variety of foods to enlighten our taste buds such as frozen yoghurt, gelato, gluten free banana bread, organic smoothies and many more. Students also got to see numerous creative and extraordinary foods on display. This day was a great learning experience for students that will help us to achieve the standard we are currently working on. We would like to thank Mr. Davis and Mrs Townsend for taking us on this trip and to all the chefs, waiters and friendly staff for the exceptional food and welcoming service. 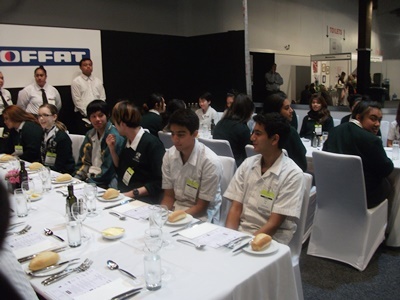 Michael Davis, Year 12 Hospitality, filed the following report..
On the 18th and 19th of August the New Zealand Culinary Fare was held at the Vodafone Events Centre in Manukau . 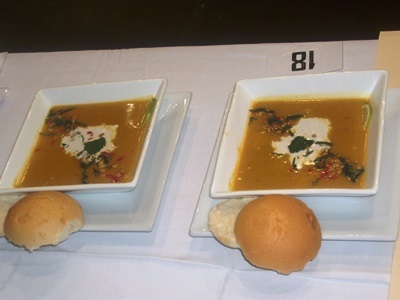 Fiona Suilaman and I competed on the Monday in the Secondary Schools’ Vegetable Soup Competition. We were both quite nervous but that changed after seeing the amazing dishes produced by the other chefs competing; we couldn’t help but gaze in awe. We had had more than 3 practices each, with crucial feedback from Mrs Townsend and Mr Davis and so we produced amazing results when competing. I won the competition and Fiona received a silver medal coming fewer than 10 points behind. On the second day the Secondary Schools' Burger competition was held. It is a new competition being held by the Auckland City Council called “What’s your Flavour”. All 3 teams who applied from our school had been chosen by the judges to participate in the competition. We competed against more than 4 other colleges and our tingling nerves were cooled by the very friendly judges that we had a good time joking around with occasionally. Although our teams did not win any medals that day, we still had a great time there and it was a good experience for all. 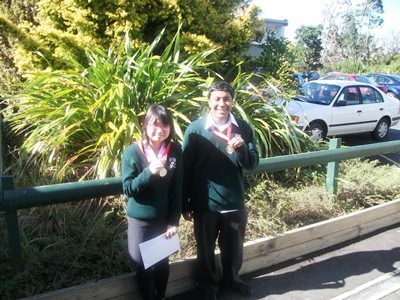 For most of our students, it was the first official competition they had competed in. 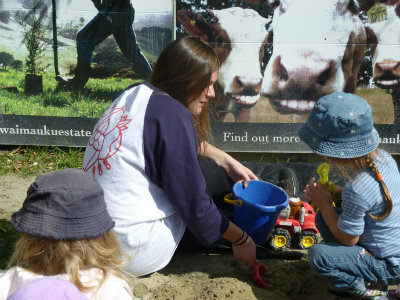 Students from the Childcare Advanced class have spent time at various local early childhood education centres. And loved it! They have gained valuable practical experience in a realistic work environment which has helped them with the theory requirements of the course. In addition, two assessments must be carried out in an early childhood education centre, so students have gained credits from this exercise. 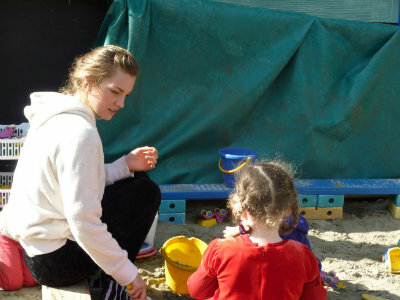 The students have really enjoyed their time working with the children. In fact, several students have decided to train as ECE teachers next year! We are very appreciative of the welcome and support given to our students by early childhood teachers in our community. 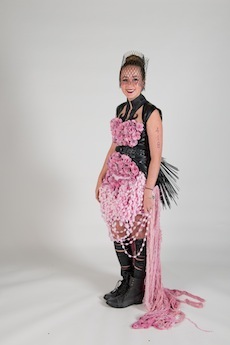 Lynfield's best Trash to Fashion creators and their creations will be competing in the final of the Auckland Council's 2014 Trash to Fashion competition on the Saturday 23rd and Sunday 24th August. There will be two shows on Saturday and one on the Sunday when the awards ceremony will take place. Tickets can be purchased from http://www.eventfinder.co.nz/2014/schools-trash-to-fashion-finalist-showcase/auckland/henderson. Good luck to our finalists! Anya Randel,l Aysha Khan, Elysha Neghi, Janae Van Panahon, Kayla Rouselle, Lulu Ota, Mosiana Lua, Neve Stanimiroff, Rose Faautaga. And from the Learning Support Class: Albert Ama, Lena Zhang-Harrap, Leon Bartley, Nicolette Half, Priyanka Anand, Rebecca Fleming-Yates and Sophia May. 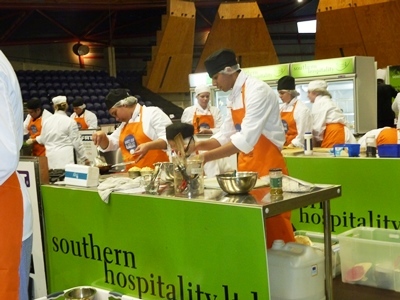 Three teams have battled it out against each other for the chance to compete against other winning teams at the grand final to be held at the New Zealand Culinary Fare 2014 later this month. The photo shows the judges with the winning Lynfield team. 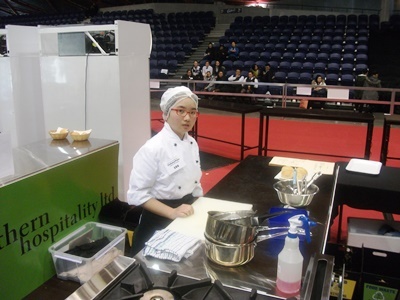 The Culinary Fair provides an amazing opportunity for students to watch the professionals at work at one of the largest culinary competitions in the Southern Hemisphere. They came into the Textiles class with a range of skills and were taught how to use the sewing machine, stencilling and applique. Students were then able to make products and garments of their own choice. Throughout their time in theTechnology Faculty they have completed bags, aprons, cushions, clothing and the photos indicate they have thoroughly enjoyed the experience. On Friday 27 June the Year 13 Fashion and Design Class and two Year 11 students who have been recognised as gifted and talented attended a workshop with DAS Training ’SewTec Fashion Academy’. During this workshop students got to gain confidence and experience using industrial machines where they constructed a tailored skirt. The class had a fantastic time and all left with a sense of accomplishment while experiencing what it’s like to work in one avenue of the fashion industry. 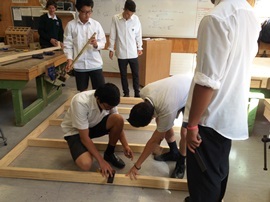 This year twenty-one Year 13 students are in the Technology Faculty's Carpentry course and they are getting as close as possible to a real-world building project. This course encourages authentic learning and the students are definitely highly motivated and thoroughly engaged - even coming to work on the project during their free time. The students are put into five groups. Each student in their group has a different role, such as Foreman, Quantity surveyor, Machining person and Labourer. 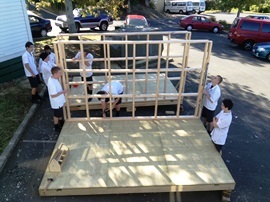 They are building huts which measure 3.6m x 2.4m. 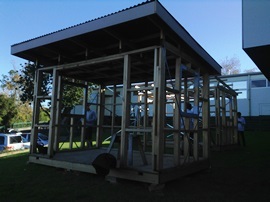 The students get a chance to learn exactly how buildings are constructed - they learn how to read plans, set up the foundation, floor construction, wall construction, roof construction, interior finish, electrical wiring and painting. 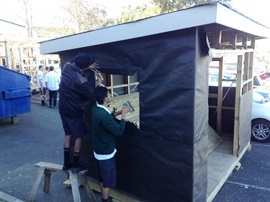 All five huts will be completed in Term 4 and the students already have pre orders from the general community to buy them. The students from Years 13 and 12 DTG (Digital Technologies )have just visited Orion Health, a software company that specialises in medical systems. 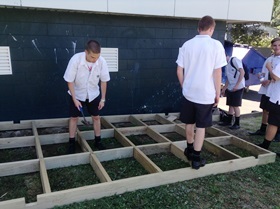 As the students will soon be making decisions about their futures they were greatly enthused and inspired by learning what a huge demand there currently is in New Zealand for the very skills they are learning. At Orion there is a huge variety of positions within the company with a great demand for workers who have a degree in computer science and software engineering. The company offers incentives to get these graduates to work for them – including offering internships for students while they are studying. The company is 21 years old and has offices in 23 countries leading to increased opportunities for employees. 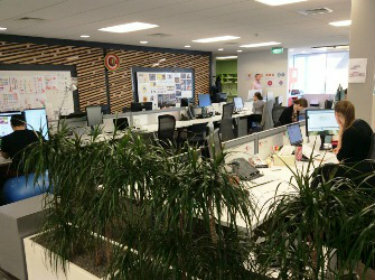 The employees get free breakfasts each day, free fruit, flexible working hours, work in an open plan environment and can wear casual clothes to work. The company also supports younger students by running the Codeworx programming challenge and sponsors the ICT Connect program which sends people working in the ICT industries to schools to talk about their jobs. The students came away with a goodie bag, and a chocolate bar (and for Dilon Dhanji, winner of an ICT quiz, a box of Favourites which he generously shared around!) but most valuably they now appreciate the opportunities that await them should they choose to continue their studies in computer science and software engineering. 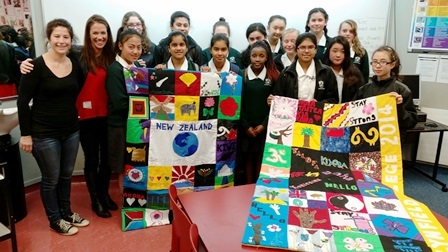 Ayesha Hodwin from World Vision has visited us to speak to the Year 9 Fabric Technology students who are in the process of creating new quilts, this year going to Bangladesh. 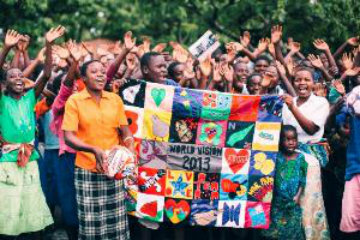 World Vision took a team of five youth Ambassadors to Malawi at the end of last year and took the six quilts that our students made. 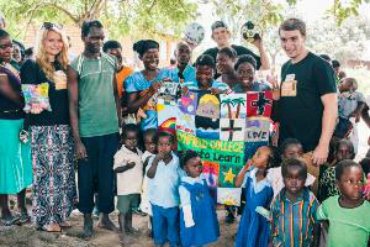 The images below show the various groups of students who received our students' quilts. Year 10 Soft Materials and Learning Support students have started their work which culminates in entry to the Trash to Fashion Competition. Last year Lynfield's Kayla Rouselle won the Untamed Category and the Supreme Award, so there is a great enthusiasm for mastering the skills that lead to success like Kayla's. Christopher Davis came to the college to speak on Thursday 20 March. Christopher has been a judge on the Auckland Councils Trash to Fashion and he has previously won awards in WOW (World of Wearable Art). Chris has made some of his garments out of recycled and used materials such as vinyl records, plastic cable tie, basketballs and drawing pins. The talk was valuable in giving the girls first hand advice about what the judges are looking for and the process involved in creating garments which will stand out on the cat walk.